LinkedIn is known as the Facebook for professionals. B2B proffessionals from around the world have been engaging on LinkedIn to help meet new contacts, learn and teach in their own professions and most importantly increase sales leads. 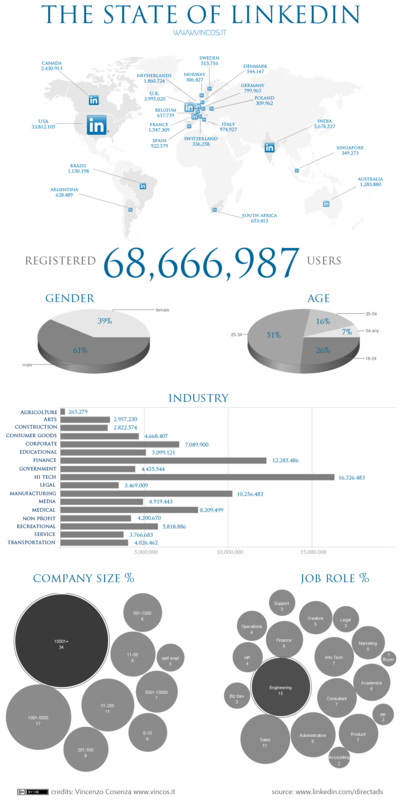 The below infographic shows the state of where LinkedIn is currently at with a breakdown of demographics, professions and geolocations of current LinkedIn users. With 1.2 million users in Australia and closing in on 70 million users worldwide it is a growing social media platform to reach out to other professionals without the unwanted social noise of Facebook and Twitter.